We know manure stinks, and our personal opinion is that hog manure stinks worst, but the Environmental Protection Agency says it needs a stronger scientific basis to charge animal-feeding operations with violating the Clean Air Act, so EPA and eight universities have begun a two-year study of the operations' air emissions. Voluntary monitoring will be conducted at 24 sites in nine states -- California, Indiana, Iowa, Kentucky, New York, North Carolina, Oklahoma, Oregon, Texas and Wisconsin, "representing a cross section of the country's animal feeding operations," says Brownfield news service. "EPA Administrator Stephen Johnson says the study is a collaborative effort between the EPA and the livestock industry that will provide the agency with the information they need to ensure that livestock operations are being good environmental neighbors," Brownfield's Jason Vance writes. The study is being funded by operators of 14,000 "swine, dairy, egg-laying and broiler chicken (meat-bird) farms" as part of a January 2005 deal with EPA, the agency said in a release. Notice they named swine first. No offense to hog farmers; your blogger speaks from personal experience, having raised hogs as a 4-H member. Click here for the detailed EPA Web site for the program. Purdue University of Indiana is the lead research agency. Its partners are University of California-Davis; Cornell University of New York; Iowa State University; University of Minnesota; North Carolina State University; Texas A&M University; and Washington State University. Wonder how your state ranks in key measurements of health, such as quality, access and equity, and what sort of overall rating those factors produce? The first comprehensive study of health-system performance in all 50 states was issued this week, and is available in various forms, including this interactive map, which has links to all the details. In addition to the three criteria above, the study also evaluated states on the basis of potentially avoidable hospitalizations and costs, and the health status of each state's population. The worst region was the Southeast, and states with large rural populations appeared more likely to rank low. The worst states, from 50th to 40th, were Oklahoma, Mississippi, Texas, Arkansas, Nevada, Louisiana, Kentucky, West Virginia, Florida, Georgia, Alabama and Tennessee. a High Performance Health System. A new study says almost 3 percent of young adults in the U.S. used crystal methamphetamine in 2001-02, a rate double that of a previous study for an overlapping period. The new research found 2.8 percent of Americans aged 18-26 during 2001-02 reported use of the drug in the previous 12 months. A study by the National Institute of Drug Abuse in 2002 found a rate of 1.4 percent among those aged 19-28. The new study was funded by NIDA and the National Institutes of Health and published in the July issue of the journal Addiction. The age group is most prone to meth use, an NIH release said. "The study found that young adult users are disproportionately white and male and live in the West, and that Native Americans were 4.2 times as likely as whites to use crystal methamphetamine," the release said. "Users also tend to have lower social economic status, use other substances, such as alcohol, marijuana, and cocaine, and the male users are more likely to have had incarcerated fathers." Crystal meth is purer and has greater potential for abuse than the powdered form. A Democratic energy bill stalled in the Senate yesterday, partly over Republican opposition to a mandate for more use of wind power, but opposition to a mandate for ethanol and other biofuels "has all but evaporated in Congress, a situation that would have been almost unthinkable just a few years ago," reports Steven Mufson of The Washington Post. "And though environmental, industry and farming groups can point to numerous unresolved concerns about biofuels' effects and feasibility, the ethanol lobby has never been stronger." But presidential politics appears to have cost another key energy player, the coal industry, the support of Democratic Sen. Barack Obama for an amendment that would "promote the use of coal as an alternative fuel to power motor vehicles," reports the Los Angeles Times. In what reporter Peter Wallsten called a "dryly worded and technical-sounding e-mail," Obama's office said he "supports research into all technologies to help solve our climate change and energy dependence problems, including shifting our energy use to renewable fuels and investing in technology that could make coal a clean-burning source of energy. However, unless and until this technology is perfected, Senator Obama will not support the development of any coal-to-liquid fuels unless they emit at least 20 percent less life-cycle carbon than conventional fuels." Obama and Sen. Jim Bunning, R-Ky., had "promoted the idea as a way to reduce U.S. reliance on foreign oil. But environmentalists charged that coal would produce a dirty fuel and exacerbate global warming, putting Obama in the awkward position of balancing the desires of an industry with a strong presence in his home state against those of a key voting bloc in the Democratic presidential primaries." (Read more) For Mufson's report on a Democratic measure that would provide loans for technology to keep carbon dioxide from coal-to-liquid plants from escaping into the atmosphere and adding to global warming, click here. For a story on the main energy bill being stalled, by Edmund Andrews of The New York Times, click here. Massey, based in Richmond, Va., also faces a record fine of $1.5 million for safety violations the federal Mine Safety and Health Administration "determined contributed to the deaths of two miners in a January 2006 fire," which is also "the target of a federal criminal probe and the subject of a wrongful-death lawsuit, which also names Blankenship as a defendant," AP's Tim Huber reports. 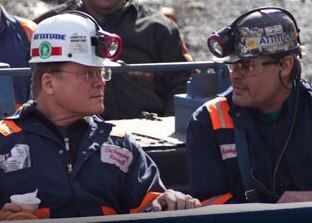 (Read more) "These and other correctible deficiencies combine to maintain a 'Blankenship Discount' in the market price for Massey's shares, and do a grave disservice to our shareholders by masking the underlying strength of the company's business, assets and workforce," Third Point CEO Daniel Loeb and analyst Todd Swanson wrote. Three months before the fire, Blankenship sent managers a memo saying, "If any of you have been asked by your group presidents, your supervisors, engineers or anyone else to do anything other than run coal (i.e. : build overcasts, do construction jobs, or whatever) you need to ignore them and run coal." Overcasts ensure proper air flow. The Appalachian News-Express of Pikeville, Ky., then a weekly newspaper, revealed the memo. Massey is the fourth largest coal company in the U.S. and the largest in Central Appalachia, and Blankenship is one of the most politically powerful people in West Virginia. He put $3.5 million into a 2004 campaign that helped unseat a state Supreme Court justice, has targeted another one for next year, and tried unsuccessfully last year to finance a legislative takeover by Republicans. He has given GOP candidates $6 million. A federal judge in West Virginia has "essentially outlawed the common coal industry practice" of building sediment-retention ponds in streams below valley fills of mountaintop-removal coal mines, reports Ken Ward Jr. of The Charleston Gazette. District Judge Robert Chambers ruled Wednesday that the practice violates the Clean Water Act and should not be allowed by the Army Corps of Engineers, which issues stream-discharge permits. "The judge also said the law protects small segments of streams between those ponds and the bottom of valley fills," Ward writes. Ward's story has simple, clear explanations of the issue and mountaintop-removal methods. To read it, click here. "Rural America is undergoing sweeping demographic, economic, and environmental changes. Whether they are harnessed effectively will depend on federal and state policies and community actions over the next decade." So begins Rural America in the 21st Century: Perspectives from the Field, a report prepared by the Carsey Institute at the University of New Hampshire for a national meeting of rural advocates this month. It concludes, "Rural America in the twenty-first century must develop new relationships and new ways of doing things to ensure an economically prosperous, socially just, and environmentally healthy future. Tapping into the resourcefulness and creativity of rural people will be essential in addressing this challenge. However, they cannot do it alone. Rural communities need critical infrastructure, investment, capital, and services." • Amenity-rich areas, which are growing as Baby Boomers retire, as more people buy second homes, and as “footloose professionals” choose to settle in small towns with rich natural amenities or proximity to large cities." These areas "must work to ensure the successful integration of newcomers and long-time residents, avoid a two-tier system of wealthy residents and those who serve them, and protect the natural environment that attracted the amenity migrants," the report says. • "Declining resource-dependent areas, which can no longer rely on agriculture, timber, mining, or related manufacturing industries to support a solid blue-collar middle class." Such areas "must develop programs to ameliorate the impact of economic decline and innovate to stem future population and job loss." • "Chronically poor communities, where decades of resource extraction and underinvestment have left a legacy of poverty, low education, and broken civic institutions." They "must expand their human and social capital to break the chain of persistent poverty," the report says. The big problems: "The decline of the rural manufacturing industries and the continuing consolidation of agriculture mean fewer good jobs available for young adults, forcing them to seek employment elsewhere. The more remote rural places are seeing the greatest population loss, leaving some communities to “die a slow death.” Many rural communities have far fewer young families today, changing the feel and culture of the community and making it difficult to maintain quality schools and other institutions." Entrepreneurship and environment: "Rural practitioners, however, also see opportunities, especially in entrepreneurship. Many rural development leaders argue that a growing proportion of workers will be self-employed. Jobs in the knowledge and creative economy are also likely to be an increasingly important part of rural America’s future. Rural leaders are looking to integrated development approaches, linking economic development to long-term resource management, social, and environmental goals. In addition, medical and financial services hold strong potential. On a deeper level, the core assets of rural areas — land, forests, water, renewable energy resources, and clean air — will continue to underpin the nation’s economy and hold strong potential for economic opportunities in rural communities. . . . Expanded broadband telecommunication is essential if rural areas are to be competitive in a global economy." Civic leadership: "The rapid rate of change, declining effectiveness of traditional economic strategies, increasing environmental challenges, and demographic transitions require leadership to guide the community in new ways of thinking and doing. . . . Some respondents described their communities as conservative and risk-averse, places where calling for change and action is not part of the civic culture. The old leadership cadre is often resistant to change, accustomed to traditional ways of doing things that worked well for them in the “old economy.” New approaches of sharing power and bringing in younger and more diverse voices are threatening to them. Many describe county officials as remote from community affairs, more overtly political, and often dominated by big business. Democracy in some rural communities is weak, with a politics of “who you know,” rather than one based on issues. Some local communities have lost trust in local and larger government, and public participation has diminished. In more remote areas and in the smallest communities, county and state governments have come to play a larger role, yet these public entities are rarely accountable to local residents." Sounds like those places could use a good newspaper or broadcast station! As the new five-year Farm Bill is being debated and much more than usual attention is focused on government programs for agriculture, a major critic of such programs, the Environmental Working Group, has posted an expanded database that it says "provides nearly full disclosure of federal farm subsidy beneficiaries for the first time." Reporters who used the database to do stories about the top beneficiaries in their counties, regions or states need to check it again, because "just about every one of those rankings has changed, particularly in rice and cotton country," EWG President Ken Cook says. Click here for the new rankings. The database "includes 350,000 new individuals who have never had a specific dollar amount attributed to them -- until now," Cook says. "For the first time, using new USDA data, we identify individuals whose subsidy benefits 'pass through' one or more plantation-scale farm business that produces vast quantities or subsidized rice, cotton, or other crops." People listed in the system for the first time "received $9.8 billion in crop subsidy benefits alone between 2003 and 2005," EWG says on its MulchBlog. Cook says the data confirm what EWG calls "the inequitable distribution of farm program payments, in which the top 10 percent of beneficiaries get 66 percent of the payments in Title 1 of the Farm Bill, while the bottom 80 percent got only 16 percent of such payments, averaging $4,508 over years. "EWG’s database shows that family farmers are getting peanuts from today’s subsidy system, while corporate agriculture is living high on the hog," Taxpayers for Common Sense, a spending-watchdog group, said in a press release. The Nebraska-based Center for Rural Affairs says the new database "can and should be used to examine how large, aggressively expanding operations utilize loopholes in current law to evade statutory limits. Those loopholes allow such operations to obtain the unlimited payments that they use to bid up land costs and, in the process, drive their smaller neighbors out of business." Las Vegas water officials have "lusted after groundwater beneath rural valleys to the north for more than 15 years," Berkes reports. "It may be the easiest to access, given significant political and technological problems with other plans. So, they've applied for water rights in seven sparsely-populated valleys." The Southern Nevada Water Authority ultimately has its tongue out for 65 billion gallons of water each year, to be delivered by a pipeline costing over $2 billion. The agency "is not seeking access to water already used by ranchers and farmers, except in the case of five ranches it has purchased outright for their water rights," Berkes reports. "But, there's deep concern in the rural valleys that any drilling and pumping of water for Las Vegas will stem or stop the flow to existing wells and springs used by wildlife, livestock and crops." The state engineer "has awarded southern Nevada about one-fifth of the water it sought," Berkes reports, "but only conditionally. The underground water system must be studied first, and then pumped and monitored closely for 10 years. If other wells and springs begin to lose water, pumping for Las Vegas could be curtailed." Berkes' report is the first of a two-day package. To read or hear it, click here. Berkes dredged up a 1991 NPR interview with the authority's water czar, Patricia Mulroy, in which she said, "Ninety per cent of Nevada's water goes to agriculture and generates 6,000 jobs, which is less than the Mirage Hotel generates. The West was settled by the federal government as an agrarian economy (but) it isn't that anymore. . . . The West is becoming an urban area." For counterpoint, Berkes has rancher Cecil Garland: "What Las Vegas has got to learn is that there are limits to its growth. . . . Gluttony, glitter, girls and gambling are what [Las Vegas] is all about. What it's all about here [in Callao] is children, cattle, country and church." Then Garland raises a fundamental question. "Would it be crops or craps that we use our water for?" Jim Webb, left, the Democrat elected U.S. senator from Virginia in a big upset last year, is "trying to remake the American electoral landscape from the ground up," beginning in Appalachia, Rolling Stone says in its June 14 edition, introduciing a good profile of Webb by Jeff Sharlet, who sets the scene with Webb's visit with coal miners and families in Lebanon, Va., after touring the Laurel Mountain Mine (photo from Webb's Web site). "After 9/11, the old labels don't apply," Webb told Sharlet. "The country is just a different place. And now we can remake the party system in the United States if we can get Reagan Democrats -- or whatever you want to call 'em." Politics tends to be defined by presidents; Tom Wolfe, a friend and fellow author, "insists Webb will be president one day" and sees him "as a revolutionary -- a conservative who could succeed where the left failed," Sharlet reports. Webb, a highly decorated Vietnam veteran who was Navy secretary under Ronald Reagan, "loves war so much he can't stand to see one bungled as badly as Bush has the one in Iraq," Sharlet writes. "There's only the cause driving this stupidity into the sand, not the needs of a nation. It's the work of the elites Webb has always hated." He quotes Webb: "America's top tier . . . are literally living in a different country. Few among them send their children to public schools. Fewer still send their loved ones to war." The elites of his ire were once liberals; now they are conservatives and businesses that profit from war. Webb was once a Republican; now he is a Democrat who models himself after Andrew Jackson, "another man of war who went to Washington on a populist crusade." (Read more) Webb wrote about Jackson in Born Fighting, a history of the Scots-Irish in America, which begins with Webb's roots in southwest Virginia. "A new national poll indicates rural Americans are no longer reliably Republican and the Bush administration's conduct of the war in Iraq seems mainly to blame," reports Howard Berkes of National Public Radio. "President Bush's dominance in rural counties is credited with giving him his winning margins in both 2000 and 2004, but the new survey of 804 likely voters living beyond cities and suburbs indicates that the Republican formula for winning presidential elections is losing a key component." Asked how they would vote if the presidential election were held today, 42 percent said they'd vote for the Democratic candidate, and 4 percent said they leaned in that direction; 37 percent said the Republican candidate, and 4 percent said they leaned that way. Seven percent remained undecided, and 2 percent said they would vote for some other candidate. The error margin was plus or minus 3.46 percentage points. The overall Democratic advantage of 46-43 was a huge turnaround from the 2004 election, in which found that 59 percent of rural voters said they voted for Bush and only 40 percent for Democrat John Kerry. "But rural voters remain more conservative than the nation as a whole, creating an opportunity for Republicans to make up their losses," noted the Center for Rural Strategies, which commissioned the poll. The poll was the latest by a bipartisan polling team working for the center, a non-partisan group trying to focus attention on rural issues. Pollsters Anna Greenberg and Bill Greener said in their memo about the poll, "Given the current national climate, Republicans must win rural areas to see success in 2008, while Democrats in turn have a historic opportunity to strike deep into the Republican base. For these reasons, rural America may emerge as one of the most heavily contested parts of the country." The poll was taken May 31 through June 5 in counties outside metropolitan areas, so it includes people living in small urban areas and does not include rural residents of metro areas. For other results, click here.